Written January 8. 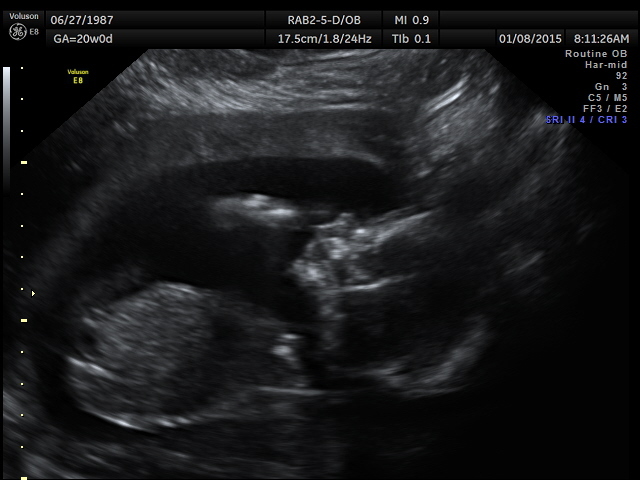 20 weeks… Halfway to meeting Baby Romenesko! This morning we had our 20 week appointment — the ULTRASOUND. There are very, very few things in life that leave me speechless. This, my friends, was one of them. Putting into words the experience of seeing our baby, a baby that actually looks like a baby instead of a little gummy bear, was so difficult. But I wanted to try anyways. I mean honestly, being able to see this gift that God has so graciously chosen Peter and I to have was just breathtaking. And tear jerking. I really liked that… Enough to remember it three years later! As our 20 week appointment approached, I started thinking that maaaaaaaaaaaybe I wanted to know the gender. I proposed this new idea to Peter and he was like NOPE! You wanted a surprise! We’re keeping it a surprise! Immediately upon walking into our appointment, I said, “Hello! We don’t want to know the gender of the baby! !” Because I KNEW that if we got to a point where the ultrasound technician asked me if I wanted to know, I would have caved. The tech was WONDERFUL and she said that she would avoid that area of the baby all together so that we didn’t see anything that we didn’t want to see. She warned me that I wouldn’t be able to call back in a week and ask, because she wouldn’t even know the gender. I’m just glad the temptation is over! What we do know is that we have a really active baby! Twisting and turning, moving all over the place! The appointment took a little longer than it should have because the baby just wouldn’t hold still for all of the measurements to be taken. The tech got everything she needed though, and the baby looks fabulous. Measuring right where it should be, due date is still the end of May, and average in size etc. Woohoo! I kept getting teared up during the ultrasound because honestly, it really was the most amazing experience I’ve had to date. Peter and I kept saying “This is so amazing!” or “That’s our baby” or “What a miracle“, and Pete would keep on giving my hand an extra squeeze every time the tech told us something else looked great. For me, as soon as we made the decision that we were going to start trying to have a baby, I knew that there was going to be someone relying on me. 100%. That’s it, just me. I started being much more conscious of the decisions that I was making when it came to my body, knowing that someone else was potentially relying on my body as well. Despite knowing that I’m pregnant, it wasn’t until I saw the human life on the ultrasound screen that I had the overwhelmingly exhilarating realization that for the first time in my life, there is another person that is 100% dependent on me. After the baby is born, of course it will be dependent on me. But it could, really, be dependent on anyone that is able to feed it, love it, care for it. For 40 weeks, though, there is another life that is absolutely dependent on me and me alone. Such a huge responsibility that became so real while I was admiring that tiny little nose and those tiny little lips. There’s our baby. Waving hello to the world. I still can’t believe that we’re having a baby.